Electricity is a paradoxical economic good: it is highly homogeneous and heterogeneous at the same time. Electricity prices vary dramatically between moments in time, between location, and according to lead-time between contract and delivery. This three-dimensional heterogeneity has implication for the economic assessment of power generation technologies: different technologies, such as coal-fired plants and wind turbines, produce electricity that has, on average, a different economic value. Several tools that are used to evaluate generators in practice ignore these value differences, including "levelized electricity costs", "grid parity", and simple macroeconomic models. 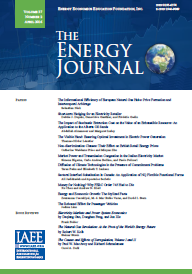 This paper provides a rigorous and general discussion of heterogeneity and its implications for the economic assessment of electricity generating technologies. It shows that these tools are biased, specifically, they tend to favor wind and solar power over dispatchable generators where these renewable generators have a high market share. A literature review shows that, at a wind market share of 30-40%, the value of a megawatt-hour of electricity from a wind turbine can be 20-50% lower than the value of one megawatt-hour as demanded by consumers. We introduce "System LCOE" as one way of comparing generation technologies economically. What Moves the Ex Post Variable Profit of Natural-Gas-Fired Generation in California? We use a large California database of over 32,000 hourly observations in the 45month period of April 2010 through December 2013 to document the ex post variable profit effects of multiple fundamental drivers on natural-gas-fired electricity generation. These drivers are the natural-gas price, system loads, nuclear capacities available, hydro conditions, and renewable generation. We find that profits are reduced by increases in generation from nuclear plants and wind farms, and are increased by increases in the natural-gas price and loads. Solar generation has a statistically insignificant effect, although this will likely change as solar energy increases its generation share in California's electricity market. Our findings support California's adopted resource adequacy program under which the state's load-serving entities may sign long-term bilateral contracts with generation developers to provide sufficient revenues to enable construction of new natural-gas-fired generation plants. The current European Union vision for a low carbon electricity system requires a large-scale expansion of overhead transmission lines to integrate renewable energy sources and ensure a secure electricity supply for the future. Recently, new installations of overhead transmission lines across Europe have been stymied by local opposition, which causes long delays in project completion and occasional cancellations. This study presents and analyzes data from an unprecedented survey on the social acceptance of transmission lines that was conducted in the EU-27. We find that auxiliary information regarding the positive effects of a grid development project can have a substantial impact in decreasing the opposition of local stakeholders. In particular, emphasizing any long-term carbon reduction potential or economic benefit of a particular project will, on average, decrease the likelihood that a local resident is strongly opposed to the project by 10-11%. In a world of uneven climate policies, concerns about carbon leakage and competitiveness for heavy industries are the main arguments against the implementation of ambitious climate policies. In this paper we investigate a potential competitiveness-driven operational carbon leakage due to the European Union Emissions Trading scheme (EU ETS). We focus on two energy-intensive sectors, cement and steel, and phases I and II of the EU ETS. From a simple analytical model, we derive an equation linking net imports of cement and steel to local and foreign demand along with carbon price. We then econometrically estimate this relation both with ARIMA regression and Prais-Winsten estimation, finding that local and foreign demand are robust drivers of trade flows. We find no significant effect of the carbon price on net imports of steel and cement. We conclude that there is no evidence of carbon leakage in these sectors, at least in the short run. We contribute to energy policy discourse in China by demonstrating the existence of multiple energy-intensity equilibria across its provinces. Using recently developed club convergence methods, we identify three unique clubs in China, each with markedly different energy intensity profiles. Unlike in previous studies, our club groupings do not strictly adhere to common geographic separations e.g. east, west and central divisions. To better understand what commonalities/disparities lay behind their groupings, we undertake a regression of the determinants of energy intensity, in a similar vein to a number of recent studies. Doing so, we demonstrate a number of significant differences in the determinants for each of the identified clubs, given which we are able to offer a rich set of policy implications. Not all determinants are common across the three clubs, and where they are common, they can differ both in magnitude and sign, reflecting the fundamental differences across the groups. This article compares different incentive policies to encourage the development of renewable energy (RE). These incentive policies (carbon tax, feed-in tariff, premium payment and quota system) are modeled in a simplified radial power network, using price-responsive demand. Most results are derived assuming an oligopolistic Cournot competitive framework and that the costs of subsidies are covered by the government (i.e., customers do not directly pay back for the subsidies). We compare the different RE incentive schemes at different congestion levels in terms of energy prices, RE generation, CO2 emissions, and social welfare. We find that the effectiveness of the different incentive schemes varies significantly depending on the market structure assumed, the costs of renewable energy, and the subsidy recovery method considered. Subsidy policies (FIT and premium payments) are more cost effective in reducing CO2 emissions than those policies that apply penalties or taxes, when assuming oligopoly competition and that customers do not directly pay back for the subsidies. Quota and carbon tax policies are more cost effective when assuming that either a perfectly competitive electricity market takes place or customers directly pay back for the subsidies. Additionally, we show that, in the feed-in tariff system, there is an interaction among incentive levels for renewable energy technologies. Given a certain feed-in tariff price to be set for a particular renewable technology, this price influences the optimal feed-in tariff price to be set for another technology. Proposals to reform default 'flat-rate' electricity tariffs are rarely met with enthusiasm by consumer groups or policymakers because they produce winners and losers. Proposals to initiate more cost-reflective time-of-use rates will be met with cautious interest if the basis of customer participation is 'opt-in'. Using the smart meter data of 160,000 residential customers from the Victorian region of Australia's National Electricity Market, our tariff model reveals that households in financial hardship are the most adversely affected from existing flat-rate structures. Even after network tariff rebalancing, Hardship and Concession & Pensioner Households are, on average, beneficiaries of more cost-reflective tariff structures once Demand Response is accounted for. Solar photovoltaic (PV) system prices in the United States display considerable heterogeneity both across geographic locations and within a given location. Such heterogeneity may arise due to state and federal policies, differences in market structure, and other factors that influence demand and costs. This paper examines the relative importance of such factors on equilibrium solar PV system prices in the United States using a detailed dataset of roughly 100,000 recent residential and small commercial installations. As expected, we find that PV system prices differ based on characteristics of the systems. More interestingly, we find evidence suggesting that search costs and imperfect competition affect solar PV pricing. Installer density substantially lowers prices, while regions with relatively generous financial incentives for solar PV are associated with higher prices. Energy consumption and greenhouse emissions across many countries have increased overtime despite widespread energy efficiency improvements. One explanation offered in the literature is the rebound effect (RE), however there is a debate about its magnitude and the appropriate model for estimating it. Using a combined stochastic frontier analysis (SFA) and two-stage dynamic panel data approach, we explore these two issues of magnitude and model for 55 countries over the period 1980 to 2010. Our central estimates indicate that in the short-run, 100% energy efficiency improvement is followed by 90% rebound in energy consumption, but in the long-run it leads to a 136% decrease in energy consumption. Overall, our estimated cross-country RE magnitudes indicate the need to consider or account for RE when energy forecasts and policy measures are derived from potential energy efficiency savings. This paper attempts to shed light on the relative merits of centralized electricity markets with multipart bids and dispatch using an MIP-based unit commitment optimization approach vs. self-committed markets with linear energy supply curves. We conduct an empirical study of data from the Colombian market, which in 2009 transitioned from a self-commitment paradigm to a centralized unit commitment approach where generators offer a linear supply function for energy along with start-up costs while the commitment and dispatch are determined by the system operator using MIP-based optimization. The results indicate that the transition to centralized dispatch has resulted in productive efficiency gains through a decrease in production costs. However, these gains have not translated into wholesale price decreases; in fact, wholesale prices increased after the change in the dispatch approach. These results suggest that productive efficiency gains have been captured by suppliers through the exercise of market power. In a non-renewable resource market with imperfect competition, both the resource rent and the current market influence large resource owners' optimal supply. New information regarding future market conditions that affect the resource rent will consequently impact current supply. Bleaker demand prospects tend to accelerate resource extraction. We show, however, that it may slow down early extraction by producers with sufficiently large reserves and thus small resource rents. The reason is that the supply from such producers is driven more by current market considerations than concern about resource scarcity. As producers with relatively smaller reserves accelerate their supply in response to bleaker demand prospects, producers with sufficiently large reserves will reduce their current supply. The surge in shale gas production will reduce residual demand facing suppliers to the European gas market. We demonstrate the effects of this in a numerical model. Most gas producers accelerate their supply while Russia reduces its supply slightly and thus loses market shares even before the additional gas enters the market. Inadequate information is often identified as a potential cause for the so-called "energy efficiency gap," i.e., the sluggish pace of investment in energy efficiency technologies, which potentially affects a wide variety of energy-using goods, including road vehicles. To improve the fuel economy of vehicles, in 2003 Switzerland introduced a system of fuel economy and CO2 emissions labels for new passenger cars, based on grades from A (best) to G (worst). We have data for all cars approved for sale in Switzerland from 2000 to 2011. Hedonic regressions suggest that there is a fuel-economy premium, but do not allow us to identify whether the fuel economy label has an additional effect on car price, above and beyond the effect of fuel economy. To circumvent this problem, we turn to a sharp regression discontinuity design based on the mechanism used by the government to assign cars to the fuel economy label, which estimates the effect of the A label on price to be 6-11%. Matching estimators find this effect to be 5%. This paper estimates the impact of two separate factors on the spread between French and German electricity prices, the amount of production by variable renewables and "market coupling". As renewable electricity production is concentrated during a limited number of hours with favourable meteorological conditions and interconnection capacity between France and Germany is limited, increases in production of wind and solar PV in Germany lead to increasing price spreads between the two countries. Our estimates based on a sample of 24 hourly French and German day-ahead prices from November 2009 to June 2013 confirm that renewable electricity production in Germany has a strongly positive impact on price divergence. On the other hand, market coupling, the establishment of a combined order book on the basis of information of both markets, which was introduced in November 2010, can be shown to have mitigated the observed price divergence. Both results have policy relevant implications for welfare and the optimal provision of interconnection capacity.